Eczema and sensitive skin runs in this Owl family – A Becky Lee suffering from it to a greater degree than I ever did. This is why it came as no surprise to me that both Little E and J suffer from a mild form of eczema and I am always on the lookout for new products that are gentle and kind to their skin. This is why when the kind folk behind the handcrafted skincare range, Four Cow Farm, offered to send us some goodies to try out, I was very excited! You see, I had already heard about the wonders of Four Cow Farm – one of my tiny little nephews suffers terribly from facial eczema which has been really difficult to shift and their creams and body wash have actually cleared it up a real treat. Four Cow Farm is a real hobby farm in Queensland, and the Four Cow Farm range was created by a midwife who was looking for skincare products to help her grandkids that suffered from eczema and sensitive skin. She eventually developed a range of baby creams and balms which she handcrafted herself using pure, natural and 100% organic ingredients, with no synthetic preservatives. In fact, all the products made by Four Cow Farm are made from food-grade ingredients (which is why they recommend that if you can, you should store them in the fridge!). It turns out that one of the family married a lovely Singaporean lady who is now helping to spread the word about Four Cow Farm in Singapore! Woohoo! Now, we were sent the Four Cow Farm All-In-One Starter Kit to try out, as well as their Pohnpei sponge and the Bath Soaks, we really like them! Here is a quick run through our favourite products from the Four Cow Farm range. 1. Four Cow Farm Calendula Remedy: This is a wonderful balm that is particularly good for calming down dry, itchy, irritated skin and is particularly good for hives, inflamed eczematous areas and nappy rashes. The calendula helps to soothe redness and inflammation within minutes whilst the rich emollient balm keeps skin soft. I like to dab this on heat rashes for instant relief and I occasionally apply it to little red noses that are sore from being wiped again and again! 2. Four Cow Farm Tea Tree Remedy: Both J and Little E love this one so much because it is just so effective, especially with mosquito bites! Every time they have an itchy insect bite or a scraped knew, they come begging me to dab a little of the Tea Tree Remedy on it. The Tea Tree (or Melaleuca) essential oil has anti-bacterial and anti-fungal properties, and the cold-pressed castor-oil has a nice anti-inflammatory effect which seems to help with itchiness too. 3. 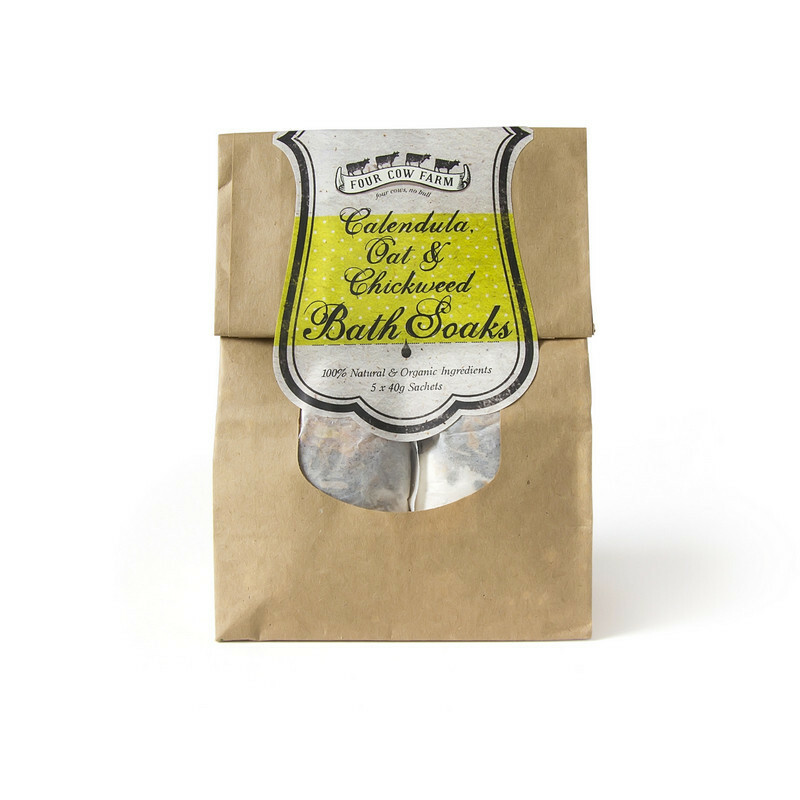 Organic Calendula, Oat and Chickweed Bath Soaks: These Bath Soaks are so luxurious and absolutely wonderful! I brought them with me on a recent trip to the UK and they were a real treat. J and Little E get very dry skin when they travel which can very quickly turn into hideous red rashes and in the past, I used to lug huge tubs of moisturising lotion with me and add almost half a bottle of lotion into their baths each day in order to keep their skin clean, soft and well-moisturised. These bath soaks do exactly the same thing, except that it isn’t a messy, greasy affair and the calendula, oat and chickweed really help to soothe irritated skin. However, Four Cow Farm worked so wonderfully for J and Little E, I cannot wait to share it! A Special For Owls Well Readers: Four Cow Farm is generously sponsoring a giveaway of Four Cow Farm’s All-in-one Starter Kit to THREE lucky Owls Well Readers! Woohoo! Update: This giveaway is now closed and the 3 winners have been emailed. Thanks for playing! If you’re in Sydney in November (or if you live in Sydney) and are looking to experience Australia’s rich theatrical culture, you might want to check out Controlled Crying at the Beecroft Community Centre from the 7th to the 9th of November. Controlled Crying is the product of Australian playwright, Ron Elisha, and tells the story of Libby and Oscar as they spend 27 years raising their daughter together. It’s a deep and realistic exploration of the roles, rules, joys and sorrows of parenting a child in the computer age. This play is 100% Australian directed and produced by my good friend and wedding coordinator, Tracey Okebey, whose directorial style (as experienced during the many appointments I’ve had regarding the upcoming nuptials) I can only describe as authoritative, but open to suggestion. The actors she’s picked for the project are pretty skilled too! Elizabeth Chambers, who is playing LIbby, is a veteran of community theatre. A childcare worker by day, astronomer and accountant student by night and performer whenever she’s free, Elizabeth is a bit of a star in the Beecroft community with roles such as The Cat in the Hat in Seussical the Musical and The Witch in Into the Woods. Plus, she’s also a director herself, having directed and written several pantomimes to date! David Roberts, the mysterious man playing Oscar, is a prolific Facebook poster and semi-employed teacher who moonlights as a man with a laptop and serious purpose. Tracey herself is no slouch either. A veteran of the acting community, she’s directs a large number of plays per year. According to the status reports I’ve had from her, the performance is in its final stages and coming together well. She’s working hard to get her actors to delve deep into Libby and Oscar’s unspoken lives to get the strong intensity of emotion that the play requires. Under her direction, Controlled Crying promises to be an emotionally intense experience. 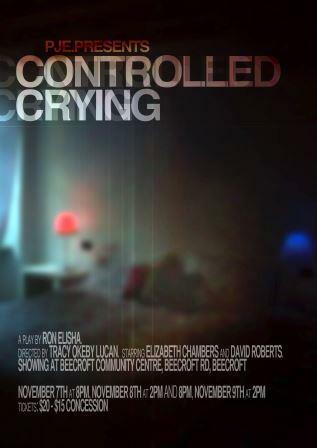 Controlled Crying will be staged at the Beecroft Community Centre on 111 Beecroft Road in Beecroft on Friday 7th November to Sunday 9th November. Tickets cost $15 – $20 and can be purchased at here. The moon. 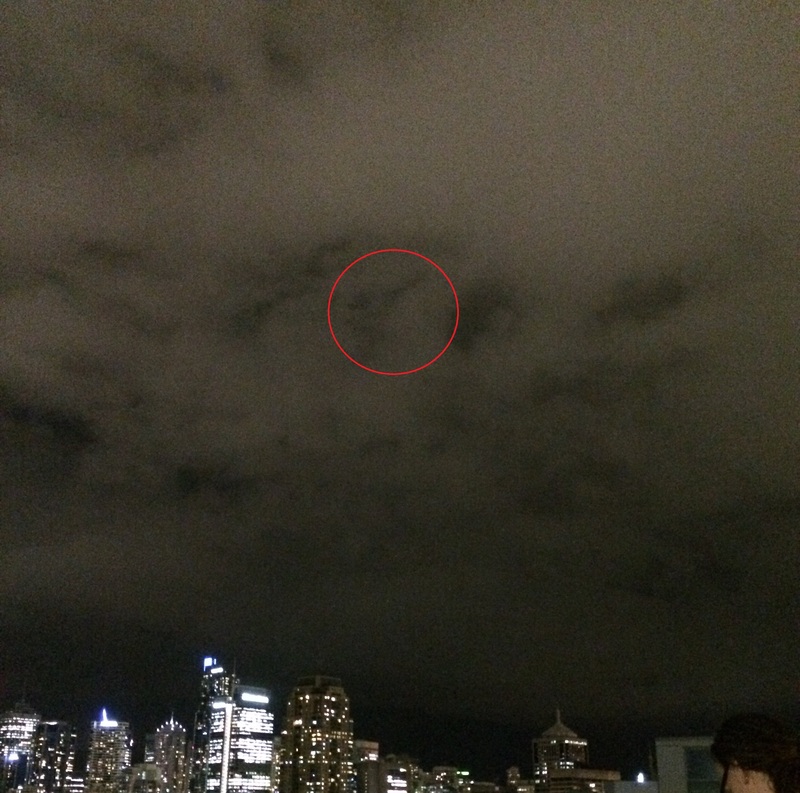 Red circle denotes last known position. Or it would have been, if we could see it. 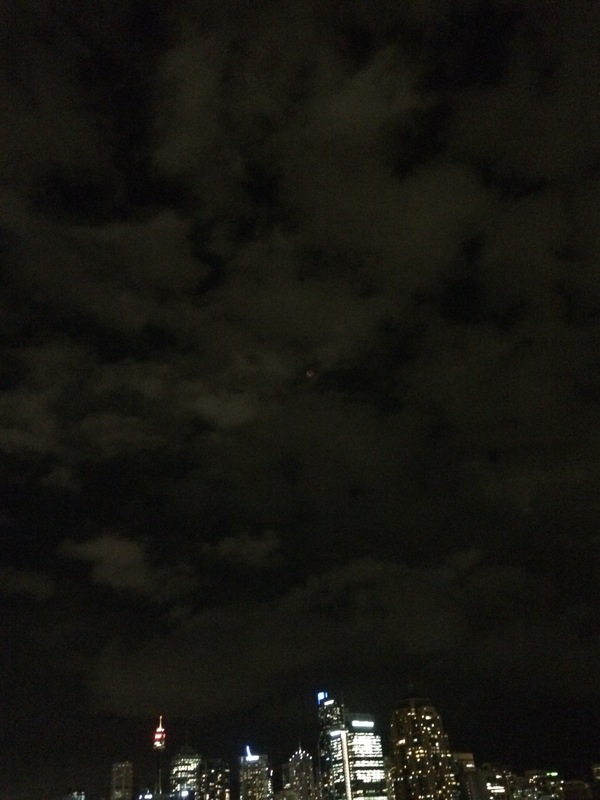 At about 9.30 PM, when the eclipse was to begin, the Aged Ps and I headed up to the rooftop of my building to see the moon in all its reddish glory. Unfortunately, the skies were so overcast that it was nowhere to be seen! After about half an hour of waiting in the windy cold, it began to drizzle. Still hoping to catch a glimpse of the moon, we huddled together under the awning and continued to watch the sky. Thankfully, the moon returned at about 10.15 PM for an encore performance and I managed to snap this picture of it with my iPhone. It was a spectacular sight. The dirt in the vermicomposter has been noshed on all Winter and is now heavy with nutrients and little red wigglers. The local supermarkets are starting to sell plants by the dozen. 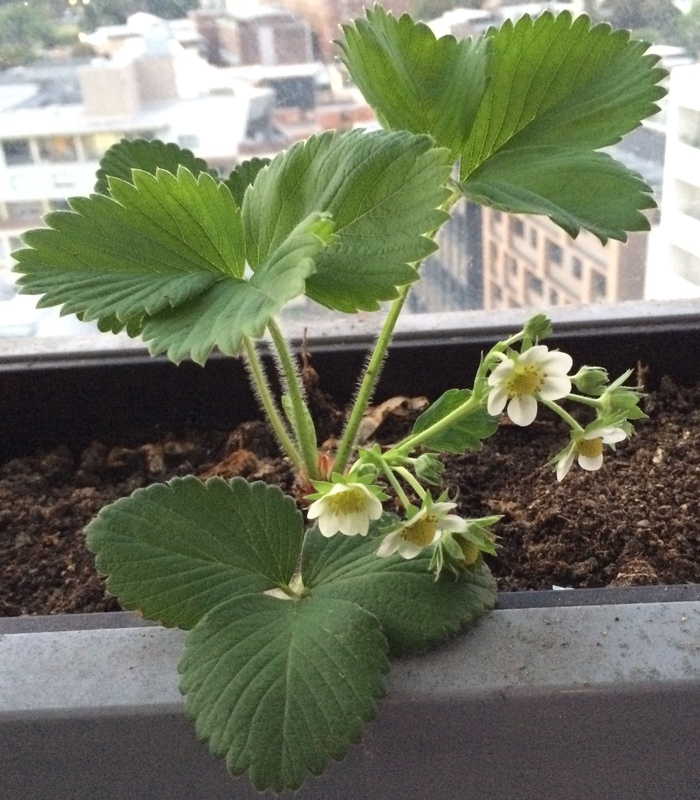 This year, I’m planting some strawberries and pumpkins, the latter of which I got for free at the local cafe. I’m really looking forward to a fruitful harvest. Later, when the worms have completed more work, I’ll be planting some parsnips, which hopefully won’t shoot to seed straight away. And, of course, eggplants, because eggplants are delicious when grilled with miso. I usually try to grow my plants from seed, which means that before getting put into the main pot, they spend some time germinating in a small plastic germination pot. When the roots grow out from the bottom of the germination pot, it’s time for transplanting! 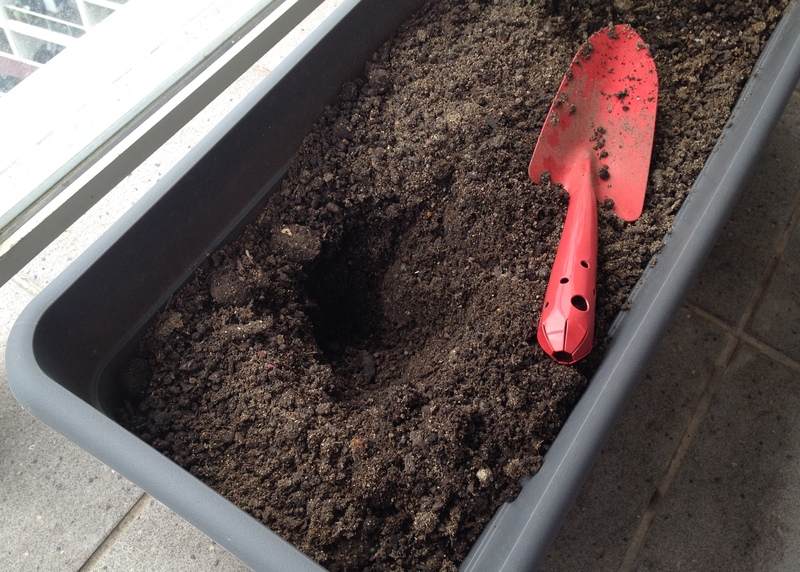 The first step to transplanting something is, of course, to dig a hole deep enough to put the plant in. You will want to make it about 1-2 inches deeper and larger than the pot to make space for the roots. Next, remove the plant from the pot. 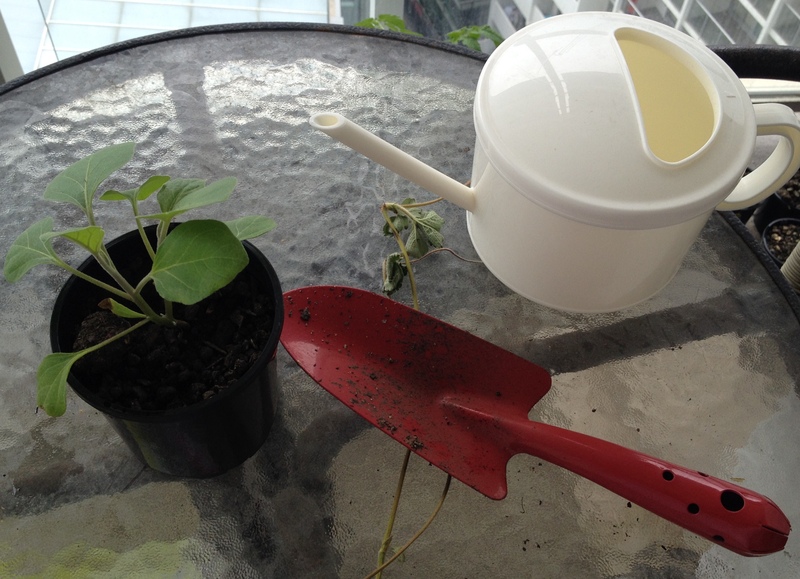 If it’s properly ready for transplanting, the plant’s roots should hold tightly to the soil in the pot. This should make it easier to remove from the pot and it should come out smoothly. 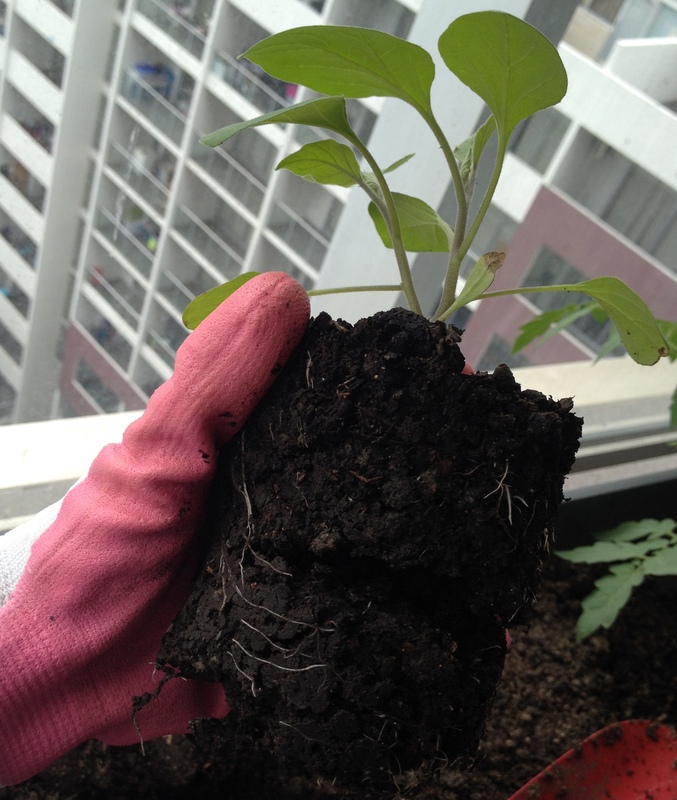 Squeeze the soil at the bottom lightly to loosen the roots and the dirt before putting it into the soil. You should cover up any exposed roots with dirt. 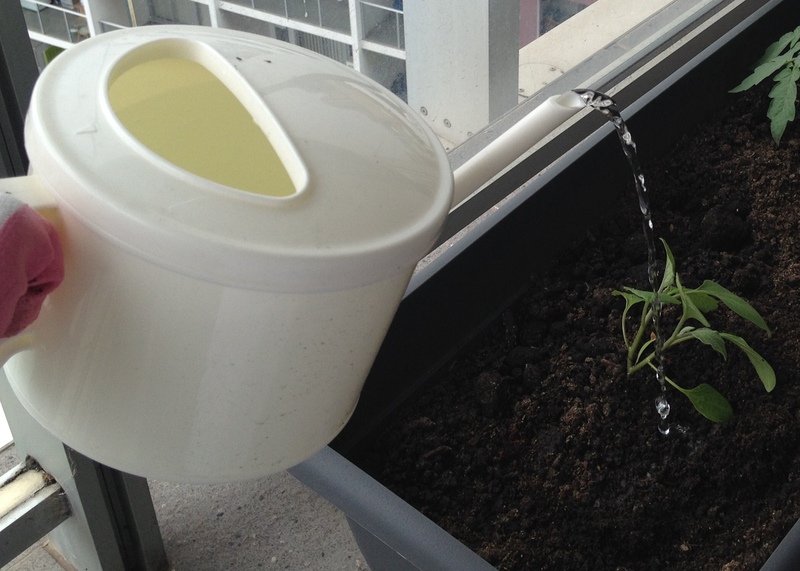 Finally, water the plant liberally until the soil has packed around the roots! Make sure that the plant is kept in half sun for a few days before putting it in full sun, as transplanted plants tend to be a little fragile! If you’re really into making lots of crop plants, you can look into companion planting, where two plants sharing the same pot don’t use the same nutrients to grow, thus helping each other grow! Over the long weekend, my phone was stolen from me by some unscrupulous other people who should really be ashamed of themselves. This letter is for them. Yesterday, when I called you and you hung up on me, I thought that perhaps we got off on the wrong foot. I did not expect that you would be smart enough to then turn off the iPhone so that the Find My iPhone app doesn’t work. That was really rude. I don’t know what on earth possessed you to take my iPhone, but I hope you’re happy with your new useless metal brick. I mean, it won’t do you any good. It’s both fingerprint and passcode locked. Now that you’ve turned it off, I’ve set it to notify the police when it’s next turned on. I mean, you could sell it, but I don’t think anyone is stupid enough to buy an iPhone that has clearly been dropped on the ground not once, not twice but several times so that the casing is full of dings and scratches. Besides, what good is my iPhone going to do for you?! With the release of the iPhone 6, it’s now a generation or so out of date! You could get like what, maybe $50-60 for it? Really not worth the whole going to jail for being a thief thing. Plus, you made me cry, which is not very nice at all. I hope that you’re happy with yourself and your life choices. Then again, I guess my Avengers phone case is pretty cool. You’ve got good taste, I guess. The Owls Well blog is now officially 1 year and a month old! Thanks to all our readers for their gracious support! 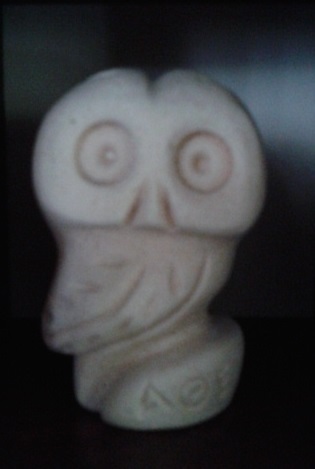 Since the start of the blog, we here at Owls Well have been asked, “Why the owls? Is there a reason behind your owl motif? 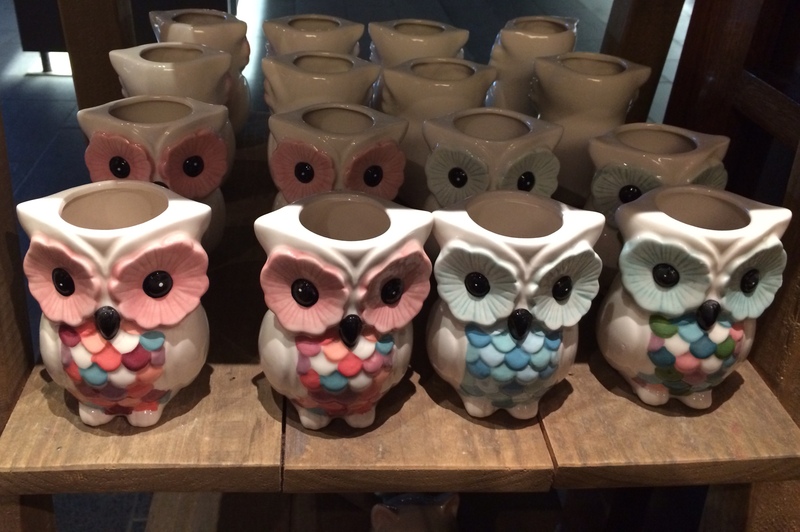 Or is it just an owl obsession?” Well, today, we intend to answer that question. The story of the owls starts with the Aged Ps. They have, over time, amassed for themselves a collection of owls of massive proportions. We have an owl clock, an owl clicker toy, owl figurines of all shapes and sizes and even (and this is my favourite) an owl bell that is also a whistle. Legend has it that when Debs was a wee child, the Aged Ps were in Alabama and found a rather cute little owl ornament on sale at a shop. Since baby Debs eyes were large and round, they decided to purchase it for display in their home, partially to commerate Deb’s second birthday and partially to remember their move to Alabama. This was the beginning of the collection. As time went by, they started to buy owl figurines to remember the many places and countries that they had visited. The Aged Ps rather liked the idea of wise owls as a motif for our family, so it stuck. And that, as they say… is that.